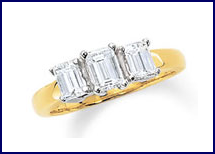 For your next jewelry purchase, come to Diamond Exchange of North Florida in Tallahassee, Florida, to check out our selection of diamond jewelry and engagement rings. Our experience has shown us that though price is certainly one of the most important factors in making a diamond or jewelry purchase, it should not be the only criteria to decide which diamond to buy. We work with you personally to better explain everything you should know when purchasing a diamond or jewelry. Like most Internet dealers, we have integrated with several diamond cutters to make many thousands of diamonds available for our clients. We offer all the best in diamond engagement rings for competitive prices; however, the cheapest quote might not be your best diamond buy. We know all about diamonds, from the wholesale costs to the markups. We can match the Internet competitors' lowest prices, so contact us today. Within the rough diamond lies the beautiful, finished product that man must coax out. The precision of the cut determines not just the value of a diamond, but its beauty, as well. Only a small percentage of diamonds are cut to absolute perfection, because it requires a greater amount of weight from the rough. Most diamond cutters work to save more weight, rather than to bring out the ultimate amount of beauty. Learn more about our selection of diamond jewelry when you contact us in Tallahassee, Florida.